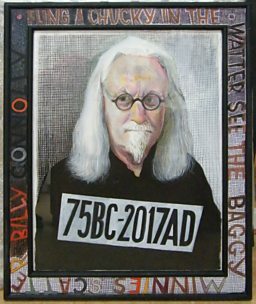 Three Billy Connolly portraits by artists Jack Vettriano, John Byrne and Rachel Maclean have been unveiled as part of The Big Yin's 75th birthday celebrations this year. The wonderfully contrasting portraits, which show different sides of the much-loved actor, musician and comedian, will become huge murals at the heart of Glasgow's city's centre and an accompanying BBC documentary and exhibition will follow next month. And now BBC Arts want you to share your own portraits of the actor and comedian using the hashtag #BigYinPortrait. Few comedians around the world can boast to being the subject of three 50-foot murals around their home city but that honour will be bestowed upon Glasgow-born performer, Billy Connolly. The portraits, which have been created in secret by the artists over the last few months, will be recreated in the coming weeks on walls around the city becoming part of the city's official mural trail. Fans will be able to see the behind-the-scenes process of the portraits in a special new documentary starring Connolly himself. Billy Connolly: Portrait of a Lifetime will screen on BBC One Scotland in June of this year (and will be available on BBC iPlayer for viewers outside Scotland). Connolly, who is himself an artist, will tell the story of the ultimate 'birthday treat'. In addition, BBC Arts offers the opportunity for fans and artists alike to join the celebrations by sharing their own Billy Connolly portraits on social media using hashtag #BigYinPortrait. Some of the best artworks will be selected for display as part of the official exhibition of the three new portraits at The People's Palace in Glasgow opening next month. Of the three artists selected to create a portrait of the hugely popular comic, Rachel Maclean might be considered the wild card, with Billy Connolly confessing he had been "completely mystified" by her work before he met her. Rachel, who is part performer and part filmmaker, is representing Scotland at the 2017 Venice Biennale. 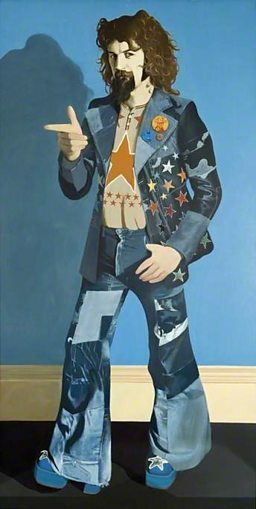 For her Billy portrait she designed, in her own signature style, an uber-kitsch Bonnie Prince Charlie-style outfit referencing several of Billy's most famous jokes, including ‘mini bike parked in bum’ epaulettes. She then dressed him up in it, with plenty of make up to boot, and photographed him in the ensemble to create the finished work which is entitled 'Big Yin' - his Glasgow nickname. Artist John Byrne has been a great friend of Billy's for many years and this is not the first time he has painted the performer's portrait. When Billy still worked in the Clyde shipyards he formed a band called The Humblebums, first with Tam Harvey and then Gerry Rafferty. It was local Glasgow artist John Byrne to whom they would turn to create their album sleeves and the artist has painted him on at least two other occasions. This latest tribute, which sees a modern day Connolly in a mugshot-style pose including a play on Billy's 75th birthday and initials, will be painted onto a wall end in Osborne Street, Glasgow. Jack Vettriano, who admits to being “a huge fan”, has chosen to depict a moment in Connolly's prolific television career. In 1994, in a memorable 'piece to camera' featuring a seriously windswept Billy on a storm-lashed coast near John O’Groats, Connolly joked about the waterfalls 'going up' while gesticulating in his own inimitable way. Vettriano is one of the most popular and successful artists in the world and his most famous painting "The Singing Butler" sold in 2004 for £775,000. His work 'Dr Connolly I presume?' will be exhibited alongside those by Rachel Maclean and John Byrne, as well as other Billy Connolly artefacts like his big Banana feet, at the People's Palace in Glasgow from June to November 2017. 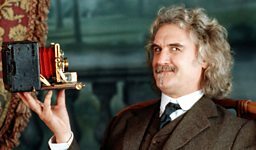 BBC ARTS wants you to share your own portrait of the much beloved Scottish comedian and actor, Billy Connolly. If you're a budding artist or an artistically-minded Billy Connolly super-fan perhaps you'd like to show off your talents? Why not have a go at your own Billy Connolly portrait and share it with us. It could be an old photo you took of Billy when you met him in the 1970s, or a brand new oil painting, line drawing or even a sculpture! Whatever your medium, take a photo and post your portrait on Facebook, Twitter or Instagram using the hashtag #BigYinPortrait. 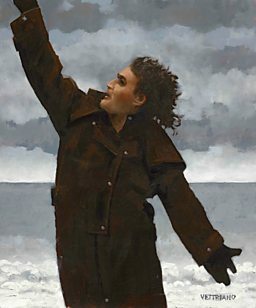 The most impressive works will be published by BBC Arts in a digital gallery and could catch the attention of our partners at The People's Palace, Glasgow whose forthcoming Billy Connolly exhibition featuring these original portraits by Vettriano, Maclean and Byrne has room for a handful of the best public works chosen by them. Head of Glasgow Museums Duncan Dornan said: “We look forward to seeing what Glaswegians and indeed people across the country who’ve been inspired by Billy Connolly share as part of the Bin Yin Portrait competition, there is certainly plenty scope for passion and a sense of fun as well as raw talent. We are delighted to be able to showcase them alongside three striking works of the artist himself while they are on show at the People’s Palace." To be a part of the Big Yin Portrait Project, simply include an image of your artwork on a Facebook, Twitter or Instagram post including the hashtag #BigYinPortrait or email us your image with some simple details to bbcarts@bbc.co.uk. By uploading your work of art and using this hashtag you agree that the BBC can publish your work as part of articles and other media in connection the Billy Connolly portrait project. Please ensure the work is your own. You also understand the People's Palace may contact you about your artwork in connection with their forthcoming exhibition, Billy Connolly: Portrait of a Lifetime. If sending by email please give your name, age and location. Thank you! By providing this information, you consent to us keeping this data on the Big Yin Portrait Project contributor database, where it will be kept securely and in accordance with the Data Protection Act 1998. Your details will not be used for any other service and will not be passed to any other third parties. The information you provide will only be used to contact you with information about Big Yin Portrait Project (however, if you have other relationships with other areas of the BBC, you may still be contacted by them). Please visit the BBC's Privacy and Cookies Policy for more information. Lindsey Chapman talks to mentors Pascal Anson and Diana Ali from BBC One’s Big Painting Challenge, at Swiss Cottage Library, London. Can a self-taught artist make it in the art world? This BBC iWonder guide explores how a self-taught artists can achieve success and public acclaim. In 2012, the Big Yin beat the likes of Morecambe and Wise, Les Dawson and Victoria Wood to top the poll. Billy Connolly: Portrait of a Lifetime will be shown on BBC One Scotland and available UK-wide on BBC iPlayer in June 2017. Rachel Maclean's films are queasy modern fables featuring a cast of grotesque characters. Joan Eardley's paintings helped to portray the stark reality of childhood in Glasgow’s post-war slums. The near-mythical story of Glasgow's Postcard Records, 'the sound of young Scotland' and harbinger of all indie music.